I have been asked to write an article about the AimPoint system, which claims to assist golfers on the putting green by applying the science of predictive putt technology, green reading instruction, and player performance analysis. I want to start by emphasising that I have never used AimPoint, or any competing system, and do not intend to do so. This article does not make any recommendation about its usefulness, but is intended to clarify its usage with reference to the Rules of Golf. 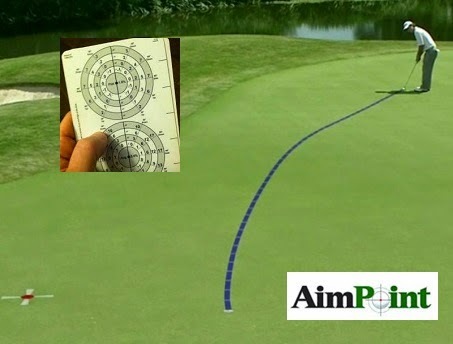 For those that are not familiar with AimPoint, it is a popular system, apparently used by a number of Tour golfers, designed to assist players with their putting, by applying their estimates of distance, level of the green at the mid-point of the putt and the grade of slope on either side, to reference charts, so as to determine an actual distance number/break for them to play. a. give advice to anyone in the competition playing on the course other than his partner, orb. ask for advice from anyone other than his partner or either of their caddies. Q. A booklet contains illustrations of the holes on a course, including isolated trees, bunkers, etc. Superimposed on each illustration is a yardage scale in increments of ten yards. Thus, a player using such a booklet can estimate how far his ball lies from a putting green or a tee. Is use of such a booklet during a round contrary to Rule 14-3? A. No. Although such a booklet is an artificial device, its use has been traditionally accepted and Exception 2 to Rule 14-3 applies. A player is not in breach of this Rule if he uses equipment in a traditionally accepted manner. In my opinion, numbers and diagrams written on a piece of paper (or stored electronically) can be considered as a sophisticated extension of the type of information that many players and caddies pre-prepare before an important round, or in other words, traditionally accepted aids. Q. A player walked on his line of putt. Did he incur a penalty for a breach of Rule 16-1a? A. Yes, if he did so intentionally. No, if he did so accidentally and the act did not improve the line. So, a player may not stand anywhere on their line of putt, which incidentally includes a “reasonable distance” on either side of the line. This seems to diminish the potential accuracy of the data that could be obtained about the line of putt, as the player must walk away from the intended line of putt. Walking alongside the intended line of putt could also be detrimental to the lines of fellow competitors, or opponents, faced with similar putts, or putts that transverse the line being walked, which at the very least is a breach of common etiquette on the greens. With regard to undue delay, the use of the charts is inevitably going to take some additional time. I am not suggesting that a player should be penalised for occasional instances of spending time working out a line of putt using this method, especially if it is done whilst others are making their strokes. But if players habitually take extra time over their putts to apply this method I think that a Committee would be justified in warning them that this practice was causing an unacceptable delay to the play of their fellow competitors, which could result in penalties or sanctions. I am sure that I am not the only golfer that thinks that slow play is already one of the biggest problems facing the future of our game. Note that for any eDocuments (including my '999 Questions' eBook) purchased from my 'Rhodes Rules School' web site between now and 1st January 2016, when any amendments to the Rules of Golf will become effective, I will send updated files in January without charge. England Golf's Championship Director, James Crampton, has issued a statement on this method of reading greens. England Golf has recently received various Rules-related enquiries on the new Aim Point putting method. This method will sometimes involve a player standing with their legs straddling the line on which they intend their ball to travel as part of a process of trying to determine the break of a putt. The Aim Point-related queries directed at England Golf ask whether the above action is a breach of Rule 16-1a (It is common for a player to appear to be standing very close to their line of putt when performing the above action). 3. The stroke was made from the putting green. If an official observes an action of the above type that is of concern to them, there should be a reluctance to penalise the player in the first instance. The first step for the official should be to counsel the player. If the player disregards the counselling and continues to perform an action that is considered to meet all three of the above criteria, the application of a penalty for a breach of Rule 16-1a would be justified. Further information can be found on the R&A website at http://www.randa.org/en/RandA/News/News/2015/January/Rule-16-1a-Touching-the-Line-of-Putt-and-Players-Who-Straddle-or-Walk-Alongside-the-Line-of-Putt.aspx." The creators of AimPoint have developed AimPoint Express which does away with charts and is a quicker method of assessing the likely path. My first reaction was the easy breach of R16-1a. Especially on steep breaks. Thank you for sharing this important contribution to the subject from England Golf. I don't understand the problem of delay. The PGA Tour rule is simple: 60 seconds for the first person in the group and 40 seconds for the rest, with appropriate warning before penalty. Of course, the Tour has the staff to do timing, while amateur tournaments and weekend duffers don't. The least that players can be encouraged to do is to start reading their putts before it's their turn. And don't get me started about why the Tour hasn't penalized anyone for decades. Yes, that is exactly why I included the possibility of the AimPoint system slowing golfers play even more; 99% (just guessing!) of competition golfers do not have someone timing them, so it is up to them to play at a reasonable pace that is not going to upset their fellow competitors, or those playing in groups behind them. So if I have a 50ft putt with a rise half way through and stand half way along my line to better enable reading this last half of the putt, I'm breaking the rules? Probably! As I said in the blog, "a player may not stand anywhere on their line of putt, which incidentally includes a “reasonable distance” on either side of the line." England golfs comment on this has added clarity to the issue. However it was brought to my attention that in a recent club event one of our members was habitually and deliberately walking on their line to assess putts ( new technique for them). We do not obviously have officials on hand to warn a player in the first instance. I have yet to have an opportunity to question the player and if the allegation was correct, Would a DQ be in order? or would we take the warning issued(on foot of my investigation) as a first instance and let the result stand even though they may have been in breach of the rule on probably every hole once if not numerous occasions. A penalty of disqualification may not be imposed on a player after the competition has closed, if they were unaware that they had breached a Rule, Rule 34-1. In my opinion, the correct action for your Committee to take, is to advise the player that they are in danger of accumulating penalties for walking on their line of putt unless they change their technique. Thanks for the quick response Barry. Of course no Dq after comp is closed. Will advise player to pay close attention to their line to avoid rules breach. on a side note - a breach of 1-3 (agreement to waive rules)would allow DQ after closing.Also rule 6-6d (recording a lower score) allows a DQ but not if it's a failure to apply a penalty they did not know they had incurred. I do have an issue with this as I believe it may make it advantageous to not know the rules. Comps can't be held open indefinitely of course but sometimes when I play society golf I feel like there's almost a breach of rule 1-3, not a verbalised agreement but rather an acceptance that ignorance of the rules is OK.